NES carts were comprised of 4 main elements - the memory control chip, graphics chip, 10NES lock-out chip, and the game ROM. Different titles obviously had different ROMs, so why duplicate all the other stuff? Seems logical, albeit delving into a gray area. The lock-out chip was primarily what gave Nintendo reign over 3rd party developers. Naturally, this was the first place developers explored when seeking "work-arounds" for creating unlicensed (yet compatible) NES games. Camerica developed a bypass circuit to avoid clashing with the NES lock-out chip. 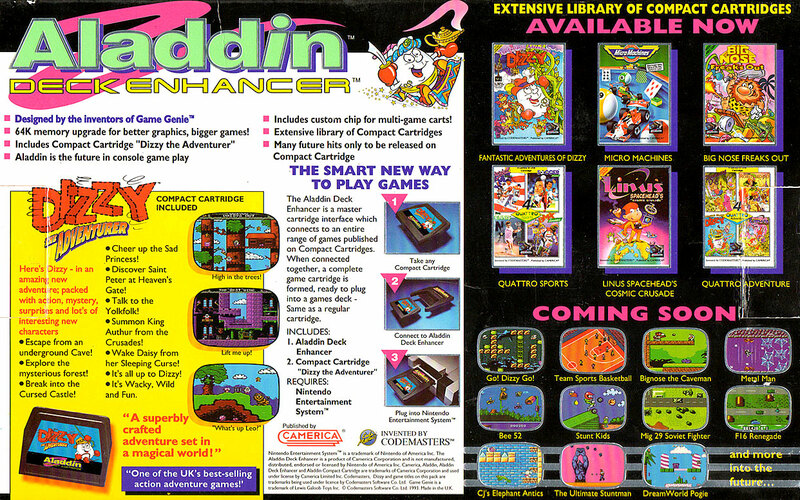 Once accomplished, they developed the Aladdin Deck Enhancer which contained all that "duplicate stuff" and accepted a smaller game cart that supplied the title-specific ROM chip. The Deck enhancer was a shell that contained the memory chip, graphics chip and the lock-out bypass. There was also a space for a smaller cartridge to connect, thus adding the ROM chip. 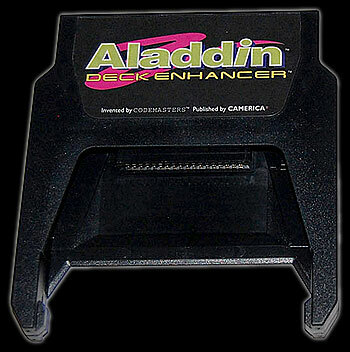 The Aladdin Deck Enhancer was a similar form factor to and NES cart and easily fit into the NES console like any regular cart. The advantage was twofold - Titles could be developed without Nintendo approval and the price per cart was far lower than most NES games. 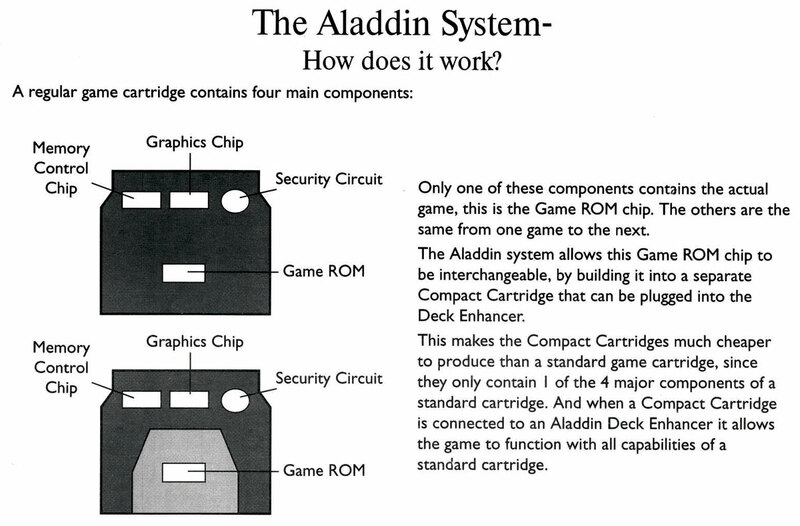 Since the Aladdin Deck Enhancer was only purchased once and contained ¾ of the chips needed to "play a game", the smaller less expensive carts needed only the ROM. One would think that making unlicensed game s for NES would be frowned upon, but the mentions of it seem very benign and indifferent. However, the biggest problem facing the Aladdin Deck Enhancer was timing. Coming to market in November 1992 was a bit late since both the SNES and Genesis were on the market and leading gamers gloriously into the 16-bit era. 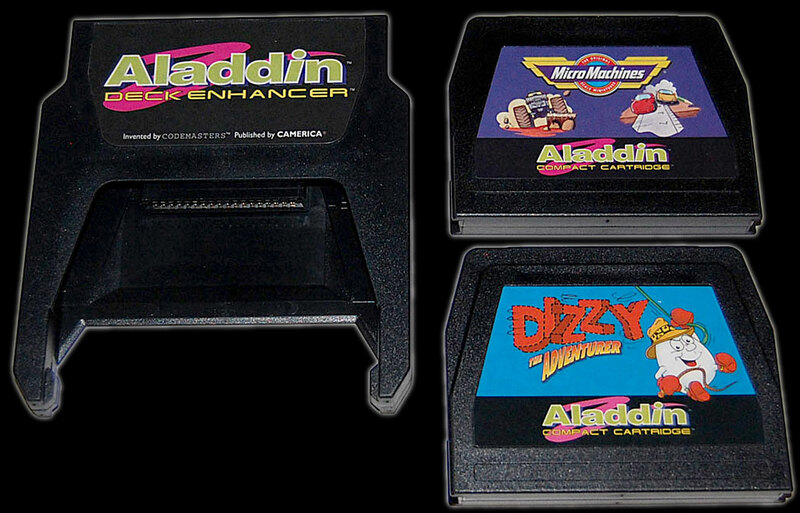 Camerica only released 7 titles for the Aladdin before their demise. Over 20 games were slated for the device and some even appeared in advertisements under the "coming soon" guise. For both the Deck Enhancer accessory and the NES, Camerica licensed rights to most of the Code Masters game library. This likely worked out better for Code Masters than Camerica. As this accessory came out after the realistic life of the NES console, Camerica was forced to shut down. Code Masters, on the other hand, is still creating video game titles. 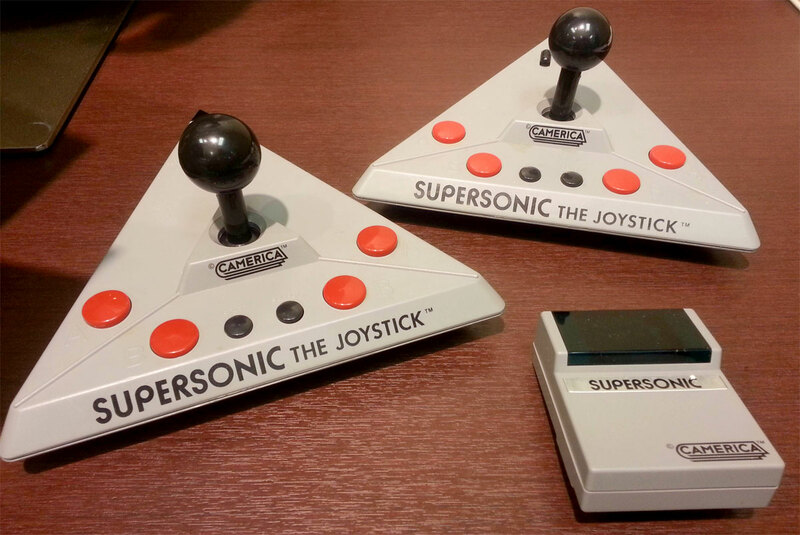 Camerica also created several NES peripherals including the wireless NES controller Supersonic The Joystick.